A tool I’ve used in the past to query my local disk drives is WinDirStat. It’s great for finding out where large files are hiding in your directories using a heat map visual. 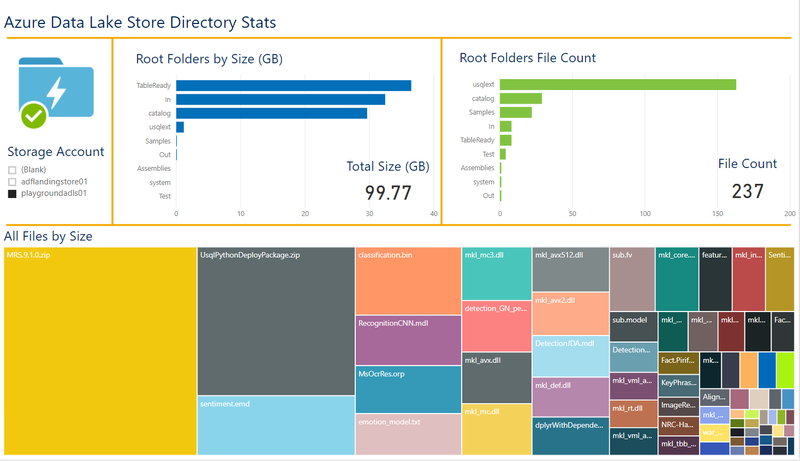 In this post I talk you through how I’ve created a similar tool for Azure Data Lake Store using PowerShell, SQL Server and Power BI. 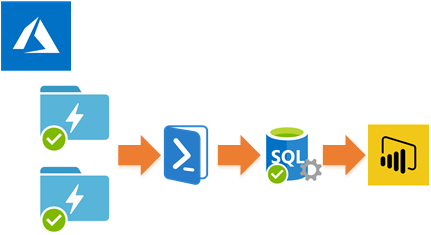 PowerShell queries your Azure Subscription and Data Lake Storage accounts writing the results to a SQL Server database table. A couple of views aggregate the data for ease. Power BI visualises the results and allows quick filtering at various levels. However, they don’t currently support a ‘recurse’ switch like you’d get with the main PowerShell Get-ChildItem cmdlet. Therefore this behaviour has to be engineered using a series of PowerShell functions. For this part of the script credit goes to Microsoft’s Alexandra Gattiker for this answer on Stack Overflow, many thanks. 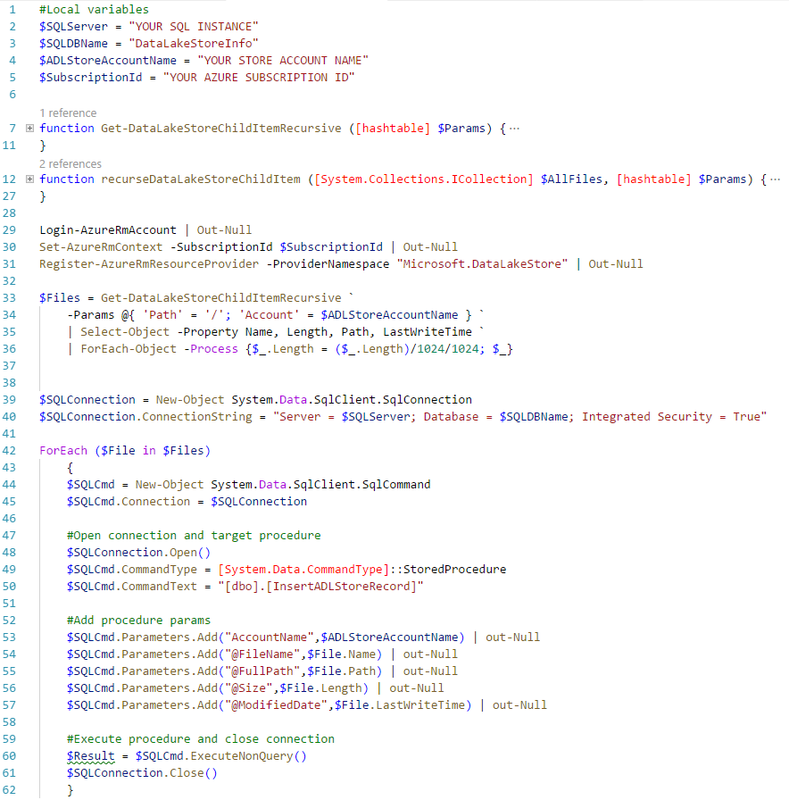 Armed with these functions I wrapped the results with my Azure login and insert records into a SQL Server table using a stored procedure call. Note; for the path parameter (line 34) I’ve left this as the root level. Feel free to query sub folders if preferred. The PowerShell script does take a while to hit all levels of your data lake store via the API so please be patient if you have a lot of files in your account. For the SQL Server part I used a very simple stored procedure that PowerShell could call for inserting each file record found. The destination table is also very basic containing just 6 fields, seen on the right. Once the raw data was inserted I created a couple of views to aggregate the data by parsing the full file path to get the root level folder names. 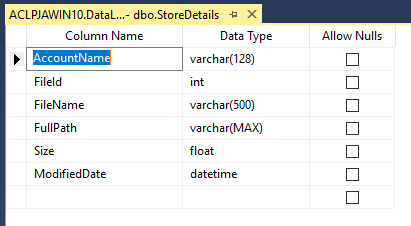 I was tempted to break out the STRING_SPLIT function here, but didn’t want to make this specific to SQL 2016 onwards. Therefore I used our old friends SUBSTRING and CHARINDEX. I would welcome any changes or enhancements people want to make to the SQL querying part. I kept it simple for the purpose of this post. 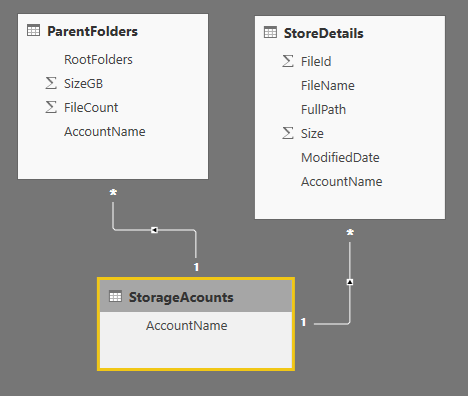 To support a single dashboard slicer my Power BI model uses the table and views from the SQL instance joined on the storage Account Name. Relationships on the right. 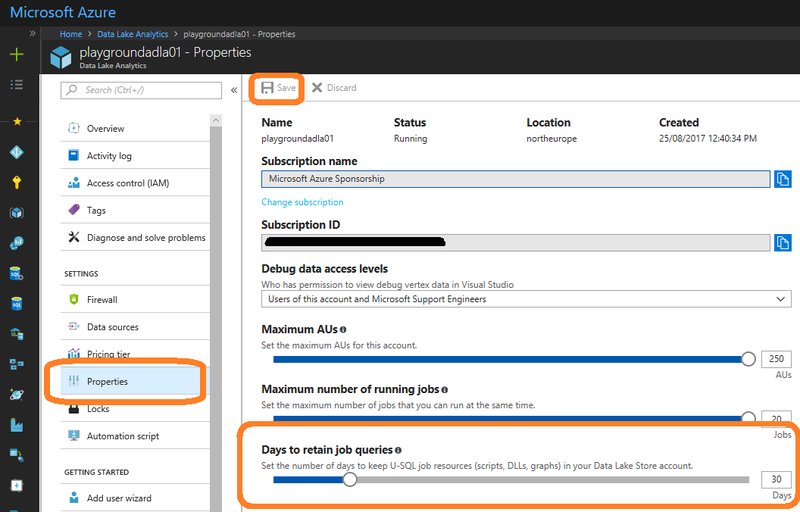 As a side note to reduce noise in your storage dashboard… If you run a lot of U-SQL jobs against your storage using Azure Data Lake Analytics you may find the ‘system’ directory contains a lot of job profile stuff that could be removed. I recommend tweaking the service properties via the Azure portal to remove this. Specifically the number of days U-SQL job data is retained. Hope this helps.